Sarah McIntyre was born in Seattle. She studied Russian literature and art history at Bryn Mawr College and then earned a distinction while doing her Master’s degree in Illustration at Camberwell College of the Arts in London. She brings her love of travel and adventure to her work, and loves the thrill of being a perpetual tourist in London, where she has lived since 1999. She was commissioned by David Fickling to produce a comic strip for the ground breaking DFC. Her creation; Vern & Lettuce was immensely popular and Sarah used both her blog and Facebook to attract new friends and fans everyday, gaining the attention of The Guardian who featured the strip in their The Comic section on Saturdays. Her picture book with Giles Andreae, Morris the Mankiest Monster, introduced the world to a loveable monster with stomach-turning personal habits, and won both the Sheffield and Bishop’s Stortford Children’s Book Awards, as voted by children. Sarah has gone on to create many more picture books including the very successful You Can’t Eat a Princess and the follow-up, You Can’t Scare a Princess! 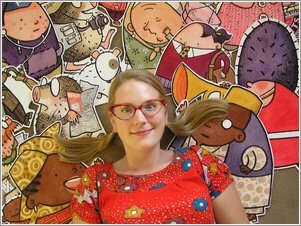 In 2013, Sarah teamed up with Philip Reeve for Oliver and the Seawigs, bonkers fiction for young readers crammed with brilliant illustrations. This was swiftly followed by Cakes in Space, and Pugs of the Frozen North which won the Independent Bookshop Week Children’s Book of the Year Award. Winner of the Winner of the Independent Bookshop Week Children’s Book of the Year for Pugs of the Frozen North. Sarah’s picture book awards include the 2010 Sheffield Children’s Book Award for Morris the Mankiest Monster.